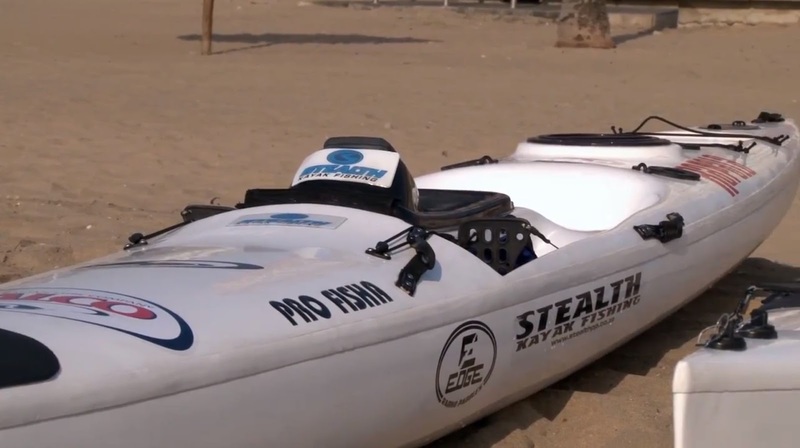 Finally here is the long awaited interview with Brett Challenor, the guy responsible for the new Pro Fisha 475 from Stealth Kayaks, a super lightweight purpose-built fishing kayak that's generating a lot of excitement here in the UK, with the first container load due to arrive on these shores in March. As someone who's just ordered the big daddy of the range, the 575, I had a whole bunch of questions I was dying to ask about Stealth's design philosophy, but I wanted to reach out to others who might have more general questions about fibreglass kayaks and their design, so I threw it out there for contributions from the Angler's Afloat forum. Naturally they were only too happy to contribute! We begin by finding out a little bit about Brett's background, how Stealth was formed and where the company is now. Brett showing off with another tiddler. How did you start building kayaks? Stealth was started over 17 years ago when I was working in my fathers boat building factory. He has been a fibreglasser and boat builder since he was 16 and is now almost 50 years in the business. At the time I was racing competitively in the lifesaving arena, competing in Australia and racing for South Africa. It was too expensive to import my own racing surf ski from Australia, so I thought why not make it myself and so Stealth was born. I went over to Australia and learnt how to build racing surf skis by working in a factory there for 3 months. I then returned home and started my dream. For the first three to four years I only made one type of racing ski. Because I was racing for South Africa and winning a lot of the races, the business was easy as everyone wants the winning craft if you know what I mean. A few years later my Dad sold out of his boat building factory and joined me in the development and growth of Stealth performance products. We branched out into the fishing market and have never looked back. My Dad and I are now a great team, with his years and years of fibreglass experience and my understanding of what makes a ski work and perform, we now design and develop all our craft on CAD and then cut prototypes on a CNC machine followed by accurate plugs and end products. I think we now make possibly the world's finest fibreglass fishing kayaks. For most kayak anglers in the UK, cost has always been a barrier and most start out with cheaper, plastic kayaks. What advantages could you expect when upgrading to fibreglass from plastic? Recently the plastic kayak manufacturers have started to realise how big the fishing market is and have started to produce some specific designs for fishing. But they're not really what the guys need and use here in South Africa, where we have so many different launches. Here you might see one plastic kayak to every forty fibreglass kayaks. But why is that? Is it just a performance factor? Yeah, it's like riding a road race on a mountain bike. You'd like to be competitive, but you can't, if you know what I'm saying. You'll never get a plastic kayak to perform like a glass kayak. You've got a lot of glide with a glass kayak. It glides, it keeps going. A plastic yak stops when you stop. It's a lot harder to paddle. If you spend 5 hours on the water, and you paddle a glass kayak you'll be tired. If you paddle a plastic kayak for that time you'll probably need to sit down and rest for an hour! That's sort of along the lines to what we've always said. There is a market for a plastic kayak, but the guys who are looking for the performance, for kayaks that are easier to paddle, easier to manoeuvre, bit more customisable, glass is way ahead of plastic. What are the main disadvantages with glass? Nothing really, you've obviously got to look after it a little better than a plastic one. Well that leads to the next question, which is how durable is glass? The way we make them these days, it's very durable. We had a customer who came in today, landed on the rocks, and it was just what we call a gelcoat (the colour). We just had to sand that back, respray it and polish it. It looks the same again. The technology that we've developed with the Pro Fishas is so advanced that we can make a really strong kayak, but it's also really light. So the durability is very, very good. What about UV damage? Is there any susceptibility for fibreglass? Er, no. Fibreglass will fade in time. But if you want to compare fibreglass to plastic in terms of UV damage, I honestly believe if you left a plastic kayak in the sun it would do more damage to a plastic kayak over time than it would to fibreglass one. Plastic starts to get brittle and takes a bit of strain. OK, I've got a question from forum user andym: Can glass be repaired easily or does it need to be taken to a specialist? It can be repaired very, very easily. Fibreglass is just a piece of material, you put what we call resin on it, and it's a patch like that. It's very simple. Obviously the specialists get you a very good finish. It's bit like a dent in your car. You can panel beat it, but you can't hide the dent. The specialists can do that and get you a really good finish. How customisable are glass yaks? They are very customisable within the realms of what you've designed, for example in our case with Pro Fishas we've obviously developed and designed what we know has worked with our customers, whether that be offshore or locally. There are certain things you can do, but the majority of it needs to be done when it's manufactured and not afterwards. I'm talking about extra handles and things like that. You know, you need aluminium paper, something sort of strengthening, something strong. Otherwise if you just put a hole in it for a handle in the kayak, it will eventually pull out, as the glass is thin. But plastic is just the same. Look, if you're putting rod holders, things like that, there's no problem because you're cutting a hole. It's just if you're putting in screws, things like that [that require strength]. A kayak can’t be all things to all men. What are the essential trade-offs in kayak design? Plenty of waterline makes for a fast kayak. Your waterline length. The more boat you have in the water, the easier it is to keep it going. You look at those racing powerboats, they're all long and thin. You know, the more waterline they can get in, the faster it can go. But then obviously you've got to have enough rocker design in them so that they go over the waves and doesn't plough through them. So what we did then with the 475, is say our customer there isn't looking for flat out speed, he wants slight better performance as well as the speed, so all we did was we shrunk the kayak and gave it a little more rocker, and that allowed the kayak to surf the waves better, didn't sacrifice the speed. Shorter the kayak, easier it is to turn. 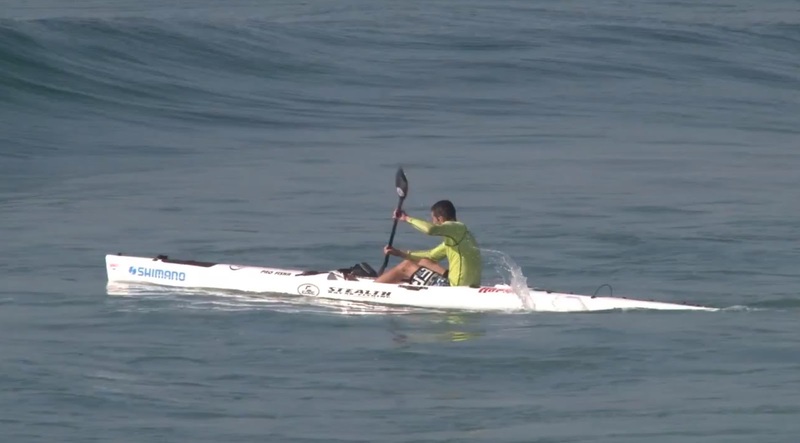 That's why you see a lot of very short, plastic surf kayaks? And that's why you see a lot of short plastics, as they don't have a rudder, so you put your paddle in and turn it. When it goes longer, the paddle can't turn and that's when you need to start putting rudders on. You produce several designs for different conditions, could you go through the range for me and explain the thinking behind them? Sure no problem. The Supalite was the first ever range of kayaks we ever designed. I started making those in 1998. It developed from an old life saving rescue craft, where it's wide and flat, and we used to lay a patient on the front when you rescue them. [laughs] And when we were bored, we used to take our fishing rods and go fishing! And then we realised we needed somewhere to hide our fishing rods, because launching through the surf in South Africa you need to protect your fishing rods, so then we put hatch inside it, and that traditional shape stayed, purely because that shape can really surf a wave. Our Supalite, I can surf that kayak pretty much like a surf board, it's got that shape. The downside is that it's a bit slow, it's a bit like a plastic kayak, it's hard to keep it going, and it's hard to paddle, but the advantage is that it's got a rudder system, it can turn and surf a wave very nicely, it's got steering and you can control it. The three kayaks in that range are obviously purely by size of person. So what was the next kayak after the Supalites? After the Supalites, we came up with the Evolution range. We wanted a slightly faster to paddle kayak. 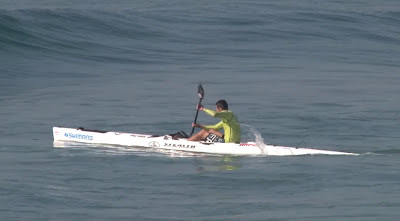 That's where I put my knowledge of surf ski racing in, and said well, let's try and combine the stability of a fishing kayak with the instability of surf ski, and give it the same sort of design so that it paddles fast and that it's easy and everything. And we did that with the Evolution range, we made a much faster paddling kayak that has all the stability, all the features of a Supalite. The popular Evolution 465, kitted up and ready to go. And yeah, we thought that was going to be the answer! But what actually happened, as people starting customising their skis, and wanting more and more, that range actually became very difficult to make it as light as possible, unless you only made it out of very fancy materials. So that's when the Pro Fisha range was launched. We started with the Fishas, which were a hybrid surf ski / fishing ski. It had a very small hatch to keep it light. They were for the client who said, "hey, I just wanna go for a paddle, if I put a rod out and catch a fish, it's a blessing!" So it started out as a kind of minimalist fishing kayak? Yeah! And it worked. We had a lot of guys in Australia who were buying them. And then, we found there were some guys who said "I don't want to use it as I want to take more than one rod". So then we took a step back, and said maybe we should design a fishing ski that's got the speed of a surf ski, the stability of a fishing ski, it's got a small hatch which is enough to take what you want, but which is made out of above average materials that keeps its weight down. Which is pretty much what we did. We converted what the Fisha range was, into something with an extra hatch in with a rod shoot that goes up to keep the weight down, and then we used the CNC machine and our CNC technology to design the kayak as light as possible. As I say, not too expensive, without using really expensive materials, but unfortunately to keep the weight down we had to convert to resins, like epoxy resins and specific core materials. And that's really where the Pro Fisha came from. Do you mean "unfortunately" from a price perspective? The epoxy resin we use is obviously way way stronger than a polyester resin. It's just a little more difficult to work with, but the process that we've developed allows us to use it, so you get a far stronger resin system. And obviously the fibreglass that we're using, we've upped that a bit, the specific core materials that we've imported, that we use within that kayak to keep the weight down make it very, very strong. That's basically how that design came about. Did you intend this range of different kayaks to be generic across the world or are they specific to South African conditions and launches? Er, well I came from spending a lot of my time overseas racing, when I was racing for South Africa, so from being a paddler. And I developed the business from a business that targeted [kayak] racing products, to a business that was more recreational, and obviously kayak fishing. 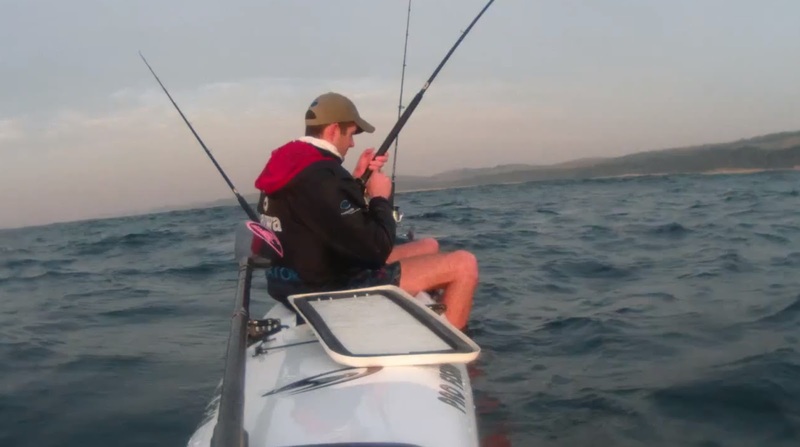 I realised that if you're going to make fishing kayaks... the Supalite range is a wonderful range for South Africa, but it doesn't suit the overseas market because they're not taking on the surf like we do everyday. There, the sea stands up and the guys don't want to go kayak fishing! Australia's exactly the same, there the guys try and find as protected a launch as possible. Yeah, so we realised we needed to find a range that suited our overseas market as well, and that we obviously identified that the Evolution range needed to be just a bit lighter, bit more manageable as well, leading to the Pro Fisha. 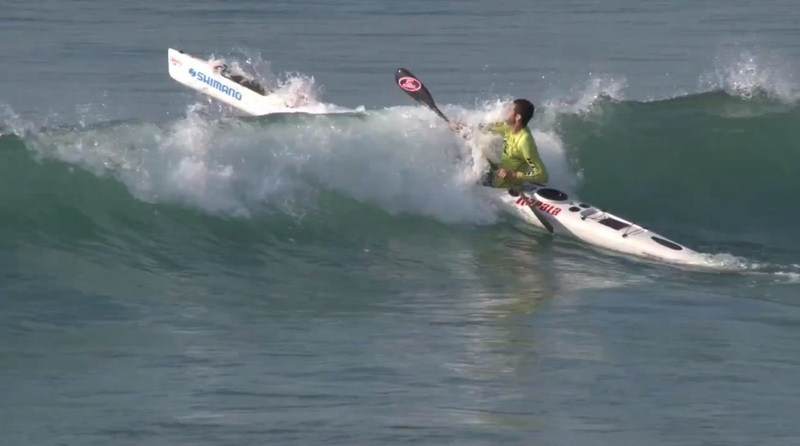 Once you're past the first few breakers, what helps a kayak handle a rough sea? Yes the hull shape, you've got to have a really nice flat area underneath. Then what we call your rails, or the edges of your kayak, where it turns up towards to the sides. If you can roll your rails, that's the terminology we use, it gives you a lot more stability. The sharper your rails are, if you have a sharp rail, what it'll give is, you think it's more stable, but it's false sense of stability. What I'm trying to say with a very sharp rail, once you go over the edge, it'll turn over very easily. It's the loss of secondary stability? Yes, it's like balancing a box. If you go over that edge, the box will fall over. If it has rounded corners you can right it to the middle again. What about length, is that factor in rough seas? Advantage or disadvantage? The length is more your speed. In a very big big wind, a shorter kayak will be easier to turn around in the wind, but the longer will have extra speed, so it'll be easier to paddle into the wind and keep it going if you need to, so it's a trade off, it really depends on the conditions. What does rocker mean and what's it's significance to yak design? The rocker is the banana shape. If you put a pen on the table, and it's got no rocker, both the front and back of the pen touch the table. If you bend the pen, so that the ends point upwards towards the sky, that's what we call the rocker. Rocker design in practice: punch through or go over? What does rocker give you? The rocker gives you the ability to surf a wave a lot easier. If you come down a wave, a kayak with more rocker means that the tail can dig in more, and the nose can lift easier, which means you can use the rudder to steer it a lot easier. Whereas with a longer kayak, you've got to have a little more speed to be able to turn it like a shorter one. Does it affect how easy it makes the yak to paddle into waves from an oncoming wind? Yes. When you launching in the surf, the kayak with more rocker will climb over a wave easier, even a broken wave, OK? Whereas with less rocker, you'll sort of punch through it more. When you're on the back line, on the outside of the wave, where the wave has finished breaking, the longer kayak will be easier because it gets over the wave with a little more speed, whereas the shorter kayak will climb and drop in, climb and drop in. Longer kayaks tend to keep their speed better going over waves. That's interesting, thanks. OK, let's move on to rudders! We had quite a few concerns on the forum. Some yaks have retractable rudders, what's the advantage of the Stealth design? And from forum user Upshall (Combat): why didn't the designer put the rudder on the stern of the kayak? Have you ever tried to turn a kayak with a retractable rudder quickly? [laughs] It doesn't! With us launching in the surf and having the conditions and stuff, your optimal position of the rudder needs to be a little bit forward from the back of kayak to turn the kayak more efficiently. Ah, so bringing it forward let's you turn more effectively? Yes, equally if you're climbing a wave, OK, your rudder's right in the back. As you're going down a wave, if your rudder's right at the back of the kayak, your rudder's out of the water, it's ineffective. If your rudders in the water and you go down a wave, you can still turn and keep control of the kayak. Staying in control, using your rails, rudder and paddle. It's about keeping the rudder in the water as long as possible? Yes, exactly. It's about keeping the rudder in the water as long as possible, to keep control and handle the kayak. Yes, those retractable rudders, if you're going over rocks they're an advantage, but that's about the only advantage. We use a very thick stainless steel shaft, so to break or bend it you've got to hit it pretty hard, and equally if you do bend it you can bend it back. It's not a major problem. Right, well, we had a lot questions along that theme. Is there any risk of it breaking by getting caught on rocks as you land? You've got to hit the rocks pretty hard. You might bend it, slightly. Like you might bend a retractable rudder. But's it's nothing you can't bend back, or you can't straighten or manipulate it, if you like. OK, we've question from forum user diyman (Ian): Is there a possibility of the anchor rope tangling with the rudder? Not really. Your anchor rope's got to be thinner than where that rudder touches the hull, so it's got to get jammed in between them. I mean the shape of the rudder, I mean if you ride over a rope, it'll follow the shape of the rudder and then drop off the back, it won't get stuck. OK, it won't get caught. How important is seating position for stability? Is the higher position a good trade off with it being a better fishing platform? It's very important. The higher you sit, the more unstable it is. You need to sit as low as you can for stability, but equally it's got to be comfortable. Stability shouldn't mean you have to compromise on your fishing positions. You're aware that your main competitor here in the UK has a very low seating position with the Dorado? Yes, exactly, the lower the seating the more stable the kayak. But it's also in the design of the kayak if you know what I'm saying. The design and the height of your seat will give you your stability. The widest point of your kayak, where you put that in relation to the depth of your seat, will give you your stability. A slightly narrower or more unstable boat, if you can drop the seat lower you'll get more stability just from dropping the seat. But you can't make the seat the same height as your feet, as that's like sitting on something flat, you actually need to have your feet slightly lower than your bum, and it's a lot more comfortable that way. That makes a big, big difference! Yeah, absolutely! Is the higher position a trade off with making it a better fishing platform? One of the criticisms of the Dorado is that because you're so sunk into the kayak, it's hard to fish side saddle. Exactly. We think the seat in ours is an optimal height. You're not so sunk into the kayak you can't change position and fish side saddle with your legs over the side. OK folks, hope you enjoyed that! I've split it here to make two articles of reasonable length. Watch out for Part 2 next week (just as long!) where Brett talks about the Pro Fisha specifically and what makes it different to anything else out there at the moment. He also discusses whether the design was inspired by their competitor Kaskazi's Dorado and goes over the full range of accessories and the various options for fitting fish finders, anchor points, etc. that Stealth offer. While not in use is crucial to keep your kayak action ready. Whether, you are storing your kayak for a full season gap or you are just storing this for a weekend or few days, proper guidance and guidelines should be followed to keep your kayak damage free. It's a very informative article.